The origin of painting is unknown. The first important records of this art are met with in Egypt; but before the Egyptian civilization the men of the early ages probably used color in ornamentation and decoration, and they certainly scratched the outlines of men and animals upon bone and slate. Traces of this rude primitive work still remain to us on the pottery, weapons, and stone implements of the cave-dwellers. But while indicating the awakening of intelligence in early man, they can be reckoned with as art only in a slight archæological way. They show inclination rather than accomplishment—a wish to ornament or to represent, with only a crude knowledge of how to go about it. The first aim of this primitive painting was undoubtedly decoration—the using of colored forms for color and form only, as shown in the pottery designs or cross-hatchings on stone knives or spear-heads. The second, and perhaps later aim, was by imitating the shapes and colors of men, animals, and the like, to convey an idea of the proportions and characters of such things. An outline of a cave-bear or a mammoth was perhaps the cave-dweller's way of telling his fellows what monsters he had slain. We may assume that it was pictorial record, primitive picture-written history. This early method of conveying an idea is, in intent, substantially the same as the later hieroglyphic writing and historical painting of the Egyptians. The difference between them is merely one of development. Thus there is an indication in the art of Primitive Man of the two great departments of painting existent to-day. Pure Decorative Painting is not usually expressive of ideas other than those of rhythmical line and harmonious color. It is not our subject. 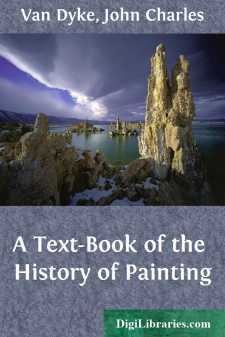 This volume treats of Expressive Painting; but in dealing with that it should be borne in mind that Expressive Painting has always a more or less decorative effect accompanying it, and that must be spoken of incidentally. We shall presently see the intermingling of both kinds of painting in the art of ancient Egypt—our first inquiry. Books Recommended: Brugsch, History of Egypt under the Pharaohs; Budge, Dwellers on the Nile; Duncker, History of Antiquity; Egypt Exploration Fund Memoirs; Ely, Manual of Archæology; Lepsius, Denkmaler aus Aegypten und Aethiopen; Maspero, Life in Ancient Egypt and Assyria; Maspero, Guide du Visiteur au Musée de Boulaq; Maspero, Egyptian Archæology; Perrot and Chipiez, History of Art in Ancient Egypt; Wilkinson, Manners and Customs of the Ancient Egyptians. LAND AND PEOPLE: Egypt, as Herodotus has said, is "the gift of the Nile," one of the latest of the earth's geological formations, and yet one of the earliest countries to be settled and dominated by man. It consists now, as in the ancient days, of the valley of the Nile, bounded on the east by the Arabian mountains and on the west by the Libyan desert. Well-watered and fertile, it was doubtless at first a pastoral and agricultural country; then, by its riverine traffic, a commercial country, and finally, by conquest, a land enriched with the spoils of warfare. Its earliest records show a strongly established monarchy. Dynasties of kings called Pharaohs succeeded one another by birth or conquest. The king made the laws, judged the people, declared war, and was monarch supreme. Next to him in rank came the priests, who were not only in the service of religion but in that of the state, as counsellors, secretaries, and the like. The common people, with true Oriental lack of individuality, depending blindly on leaders, were little more than the servants of the upper classes.